The arrow and I want to wish you and yours the happiest of holidays. We've had so much fun sharing our adventures with all of you over the last six months. Perhaps you've been inspired to go on an outing with your kids. Maybe you've read a tip that helped you on a trip. Or you could just be drawn here by the arrow's big brown eyes. (I don't blame you, they get me every time.) Regardless, thanks for reading. Your comments and kind words are the reason I do this. Many of you have given us a great deal of encouragement to try new and wonderful things as a family. I'm incredibly grateful that you pay this little blog a visit from time to time. I won't be posting next week--instead, we'll be tackling a few projects around the house and just enjoying some quality family time. But we hope you'll stick around to see what we're up to next in 2011! Every once in a while I hand the camera over to my partner in crime. 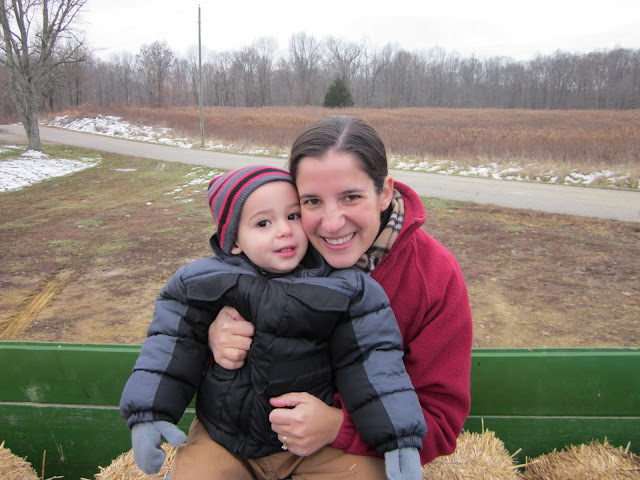 This photo was taken on our hay ride to the Christmas tree fields at Roberts Tree Farm in Seymour, Indiana, which I blogged about here last week. Happy Holidays to you !! And thanks to you for sharing your wonderful adventures with all of us ! Merry Christmas to you and your sweet family. May 2011 bring you many more adventures, happy travel posts, and lots of joy! Merry Christmas to you and yours! Enjoy your family time. Hope your holidays were happy! Love the photo...nice to see such lovely smiling faces. Hope you had a wonderful holiday! Best wishes for a Happy New Year!